“Pitt” Bauer flew 416 combat missions and shot down 57 enemy aircraft. 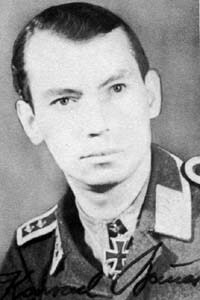 He recorded 18 victories over the Eastern front. Of his 39 victories recorded over the Western front, 32 were four-engine bombers including some Herausschüsse and at least five P-51 fighters. He was shot down seven times.